I've talked before about an Hermeneutic of Poverty and about the potential difficulty that the rich (that includes me and, I'm sure, most of my readers) have in understanding the Bible. But it's not limited to biblical interpretation, just as biblical interpretation itself is not just about biblical interpretation. This hermeneutic of poverty is also about how we interpret the whole of our experience and our identity in the world. Whether or not we are rich or poor has everything to do with how we interpret the systems we find ourselves participating with or struggling against. Our situations, both economic and social, form our imaginations, or as Jon Sobrino puts it, our "utopias". If our utopian imaginations are guided by an hermeneutic of poverty then the poor will be at the center of those imaginations. Our hope for the poor will be, in itself, our "utopian hope." Jesus often referred to the centrality of the poor in his utopian hope, in his Kingdom imagination. Jesus told story after story about the kingdom of God; the good Samaritan, the prodigal son, the shepherd who loses a sheep, none of which speak of mansions in heaven, meg-churches, or the accumulation of wealth. No, that stuff is a different narrative, it's a different dream, and it's formed by a much different hermeneutic than that of Jesus of Nazareth. For Jesus, the poor were at the center. He came to seek and save the lost (Luke 19:10). He did not dream of God's kingdom from a position of privilege, and so neither should we. The rich do not intrinsically understand the poor, and so it is against our nature to dream as they do. 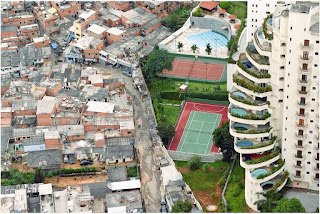 The utopias of the rich are "fantastic" visions of streets f gold; the "good life" and the "American dream." But to adopt a hermeneutic of poverty and thereafter a utopia of the poor would be to adopt a utopia of life, no longer taking for granted the things of life and trading them for hard cash and beach houses. As Gandhi said (tell me if you know where this is written), "there is enough for everybody's need, but not enough for anybody's greed." The higher we build our walls and pile up our luxuries, the harder it becomes to see over them into the real world which is truly suffering. We just can't escape from our wealth long enough to understand those for whom the system is just not working. We can even become quite bitter in our perspective, finding ourselves annoyed and even angry with the poor. We begin to think of them as criminals working against the system we've grown to love. Bell, again, writes: "If the system works for you, it can be quite hard to understand the perspective of people who have the boot of the system on their neck" (page 130). This mix-up of utopian visions doesn't happen in isolation from the church. There are many churches, though generous they may be, which find themselves trapped inside their walls, helplessly separate from the poor. They want to help, so they hurl their excess goods over their walls, just hoping that the needy might catch it on the other side. Because, in the end, they don't know the poor. Mother Teresa once said, "I want you to be concerned about your next door neighbor. Do you know your next door neighbor?" This question should haunt the rich but, sadly, it has been ignored. We don't know our neighbors who are suffering and so it's hard for the rich to dream God's dreams. We need, now more than ever, a hermeneutic of poverty--an way of seeing the world, our experience, and our identity with the poor at the center. Only then can we see the utopia that Jesus dreamed about and begin to live our lives toward it... which might mean, for some, turning around in our tracks.